Now to fill in the details. 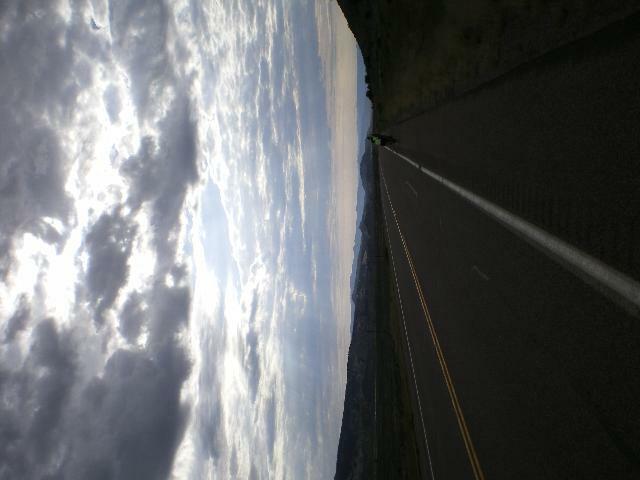 Johnny Pierce and I rolled out of camp this morning and rode together to the 27 mile mark watching the sun break through the clouds. The morning was absolutely beautiful, the road wasn't very busy yet and the temperature was quite fantastic, it was at this point that my chain jumped down in the slot between the cassette and the spokes on my rear wheel. This of course isn't where a chain belongs and it got stuck. It also resulted in a good amount of slack in the chain and my feet went for a big whoosh. Now "big whooshes" typically don't result in happy endings and this was no exception. All of the force from that whoosh ended up being applied to my dérailleur hanger which proceeded to bend in half. If you don't know what that part of a bike is... you're not alone. Half of the people riding this summer would be hard pressed to point it out on their bikes. Anyhow, it meant I had zero gears and wasn't going anywhere. I did a nice dance at the side of the road as Betsy drove by and succeeded in stopping her. She didn't have the tools we were looking for but she loaded me up and drove me back to the 19 mile mark where there was a tool kit. I succeeded in making myself a bike with two gears out of a bike with none and then set out to ride the rest of the day (plus 8 miles of bonus mileage) with those two gears (I could shift from my big to my small chain-ring up front). The route today was a bunch of rolling hills that generally gained elevation for about the first half of the ride followed by rolling hills that generally lost elevation for the second half of the ride. Doing this with two gears makes for a rather difficult day. A very difficult day in fact. My two gears gave me the option of riding at 20 kph or 32 kph, I gave up on doing 20 because it would take far too long and opted to try and ride at 32 kph. I rolled in to town ragged from the ride and searched out the bike shop. It of course wasn't a cervelo dealer and I couldn't replace the hanger but the man in there did a pretty good job of straightening it out. I should in in good shape until Denver at which point I'll have to replace the thing. I also will be replacing my big ring up front which is missing a tooth and has a mean wobble. I'm debating whether I should enlarge it to a 55 tooth or a 57 tooth from the standard 53. I'll let you know what I decide. 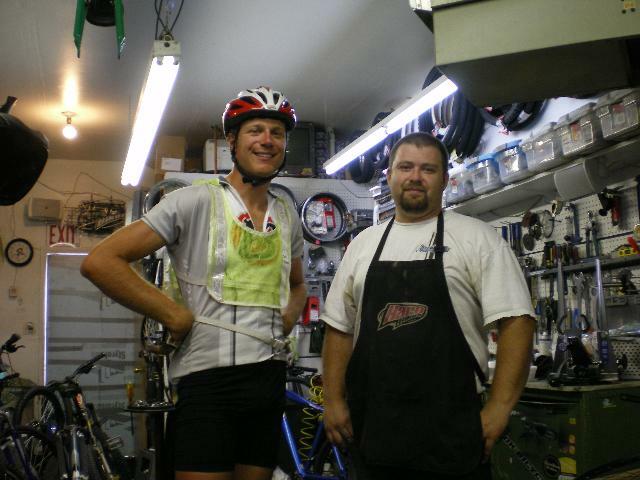 There's a picture of me with the angel at the bike shop. Wow, what a day! Hope the fix works, you might be lucky in Steamboat Springs for a good bike shop!, as the big pass is still in the way. Happy it all worked out well. I assume you didn't fall, as this wasn't mentioned... I'll stay tuned!